One of the best birding areas in the western United States and a site of international ecological significance with over 45% of North American avian species and nearly 18% of California's plant species. Background: Host to 430 bird species. Thirty-eight threatened and endangered species exist within the Seashore. Fir and pine forests border bay, maple and oak woodlands. Meadows, streams, lakes, and lagoons lie near a coastline dotted with beaches, dunes, and tidepools. Two major estuaries attract scores of shorebirds and waterfowl, including sanderlings, greater yellow-legs, northern pintails, Brant and Brown pelicans. Coastal trees are resting stops for migratory birds, some, such as western flycatchers and Anna's hummingbirds, breed here. Tomales Point sustains resident tule elk, black-tailed deer are everywhere. Harbor seals, sea lions, elephant seals and California gray whales pass close to Point Reyes Lighthouse, and the coastal cliffs are a summer nesting site for common murres. At dusk, watch myotis bats flying from the red barn near the entrance. The Habitat: The Seashore contains a variety of habitats and unique geology. The Experience: Wading birds and gulls are seen year-round. Look for songbirds in fall, with some eastern migrants. Shorebirds are common in fall and winter and waterfowl stay from November thrugh April. Look for nesting ospreys and red-shouldered hawks. Raccoons, skunks, gray foxes, and brush rabbits are active year-round. Bats can be seen from March to May. More than 850 flowering plants. Seals and sealions are present yearround. Elephant Seals and California Grey Whales are visable in December through April. 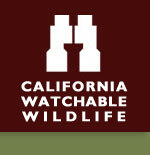 Wildlife and Where to Find It: Car, hiking, kayaking and horseback riding (some trails only). Viewing Tips: Visitor centers at Bear Valley, Drakes Beach, and Lighthouse. Camping by permit only. BEWARE OF LOOSE ROCK AND STEEP CLIFFS. How to Get There: Located approximately 30 miles north of Sausalito. Take Highway 101 North to Richmond Bridge/San Anselmo exit (#450B). Go west on Sir Francis Drake Boulevard 20.9 mi. to Olema. Turn Right on SHORELINE HWY(CA-1) and go 0.1 mi. Turn Left on BEAR VALLEY RD - go 2.2 mi. Turn left after large red barn. Bear Valley Visitor center is 0.2 mi on the right.